Bonus rooms are flexible spaces that can accommodate your family's changing needs. 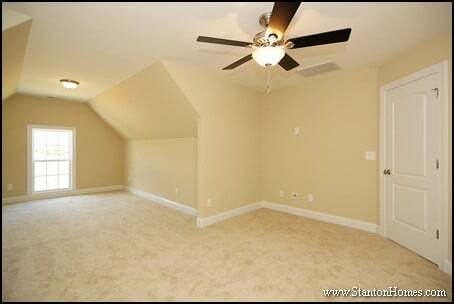 Typically, bonus rooms take advantage of large spaces above the garage otherwise left unused. 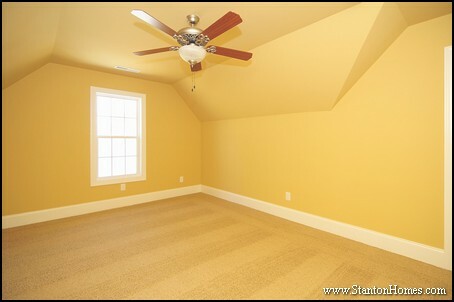 Bonus rooms are generally defined by long walls and vaulted ceilings that reflect rooflines. 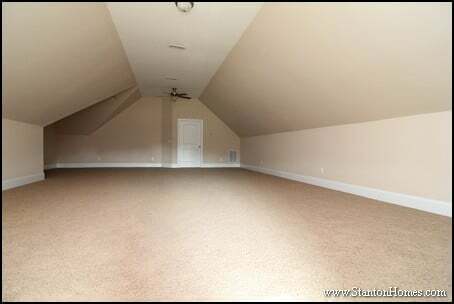 What can I do with a bonus room? 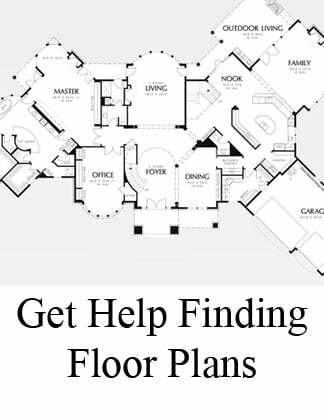 See how ten custom homes can put this space to use. Many home offices are located off the foyer or near the kitchen. 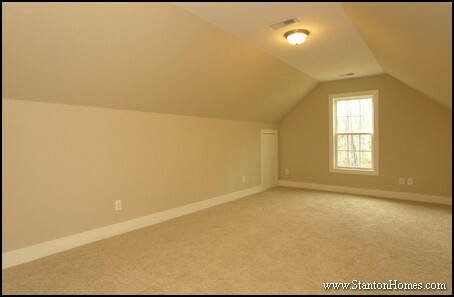 If you need a private work space, a bonus room will keep your work from being on display in high traffic areas. 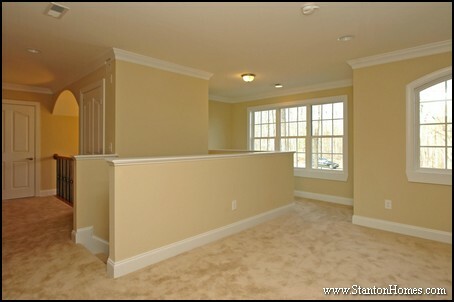 In this Raleigh custom home, a built in small bookcase area and wide dormer area make this room ideal as a work from home space. 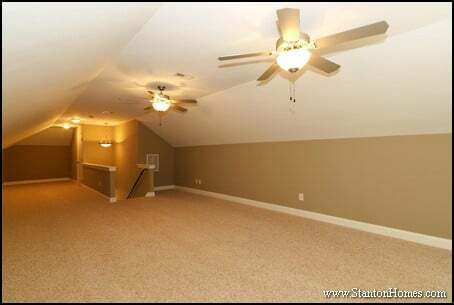 Surround sound speakers in the ceilings and a TV wall make transform this bonus room into a home theater. Whether you're entertaining guest or hosting a family movie night, a home theater (with flexible space for other needs) is a great bonus room option. Indoor hobbies - such as arts and crafts, scrapbooking, or item collecting - may require a bit of space to spread out. 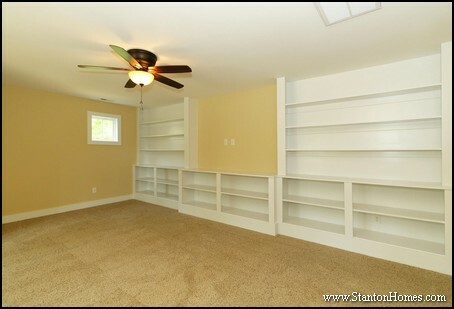 In this custom Stanton Home, a wall of built in bookcases were added to the dual-purpose bonus room. A center space was left open for flat screen TV installation. Adding a bathroom to your bonus room might be essential to your needs, when considering long-term living arrangements. 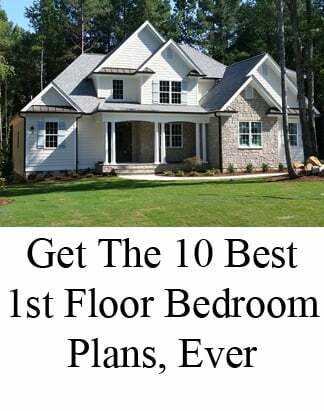 Whether you are planning for frequent overnight guests or multi generational living, a bonus and bathroom combination may become invaluable. Because bonus rooms are often long and narrow, they often serve as recreation rooms with a pool table, air hockey table, foosball table, or gaming table that sits nicely in the center. If you're looking for a dedicated exercise room, your bonus room can serve as a work out space. 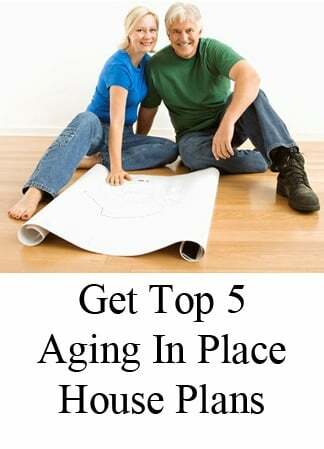 You will have enough room for a treadmill, Yoga balls, and other home-use equipment. Because bonus rooms are often designed with a TV wall, you can watch while you work out. Add a couple of lounge chairs, and you've got a built in man cave. 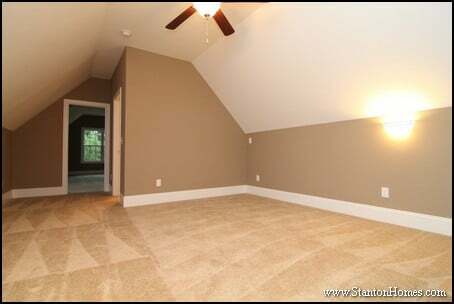 A bonus room man cave is separated from high traffic areas of the home, offering privacy and peace and quite. If you have school age children, you may decide to set up a dedicated homework station or study area. 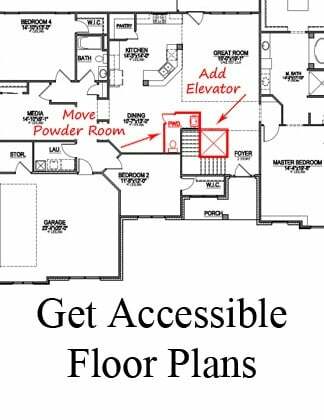 If a bonus room has multiple areas - such as the one pictured here - you can use one "room" for a homework desk, and the other as a play area. Do you or your kids play musical instruments? 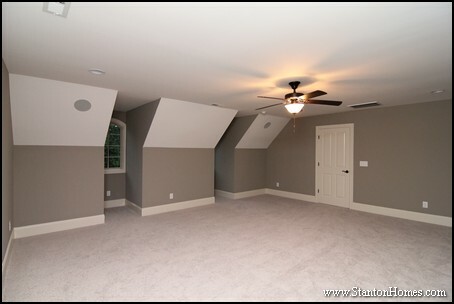 Another way to take advantage of the long walls in a bonus room is to use this space as a band or music room. Because the room is over the garage and not over the main living areas, the sound impact can be minimized. 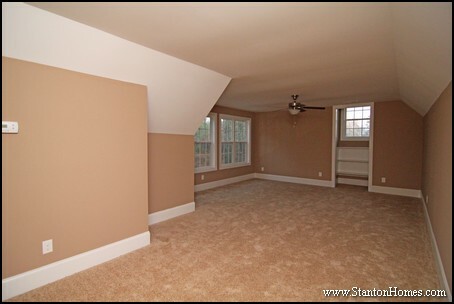 Instead of keeping the bonus room walled off, you may want to combine the bonus room with a loft area. This will give a more open concept feel, and allow you to use furniture placement to divide the spaces.